Lamp Making Kits with Antique Style Edison Light Bulbs let you turn wine bottles, canning jars and beer growlers into unique lighting accents quickly and easily. BOTTLES ARE NOT INCLUDED WITH KITS. Kits include everything you need - except for your growler, bottle or jar. Kits A, B & C have Edison Style Medium Base Socket with Push-Thru On/Off Switch. Sockets have brass finish and are pre-wired. Lamp Cords exit from side of sockets so you don�t need to drill a hole in your base. Kit D includes pre-drilled base and the socket needs to be assembled and wired. Cords have 2-prong polarized and molded plugs. NOTE: Bottles and Jars Are NOT Included With These Kits. A) Beer Growler LAMP KIT with 60W Antique Style Edison Bulb. Includes 38mm Gold metal Cap (Approx. 1-1/2" I.D. x 1-7/16" O.D. x 3/8"H), brass Neck, 6 ft. Brown Cord and Edison-base socket with push-through on/off switch. EASILY ASSEMBLED. 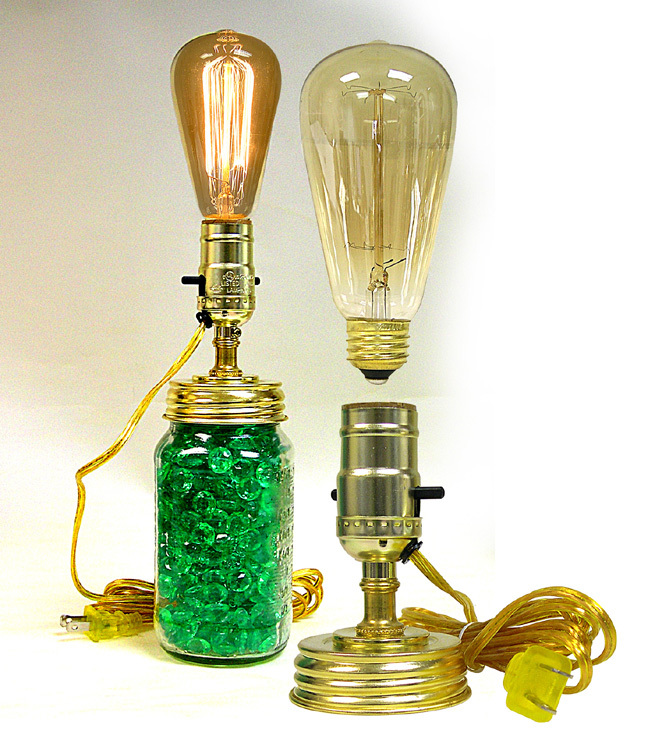 B) Brandy/Wine Bottle LAMP KIT with 25W Antique Style Edison Bulb. Includes Gold Cap, brass Neck, 6 ft. Brown Cord and Edison-base socket with push-through on/off switch. Has 3 vinyl Stoppers: 1/2", 3/4" & 15/16" dia. EASILY ASSEMBLED. C) Canning Jar LAMP KIT with 40W Antique Style Edison Bulb. Includes pre-drilled Gold Lid for 2-5/8" jar openings, brass Neck, Check Ring, 8 ft. Gold Cord and Edison-base socket with push-through on/off switch. EASILY ASSEMBLED. 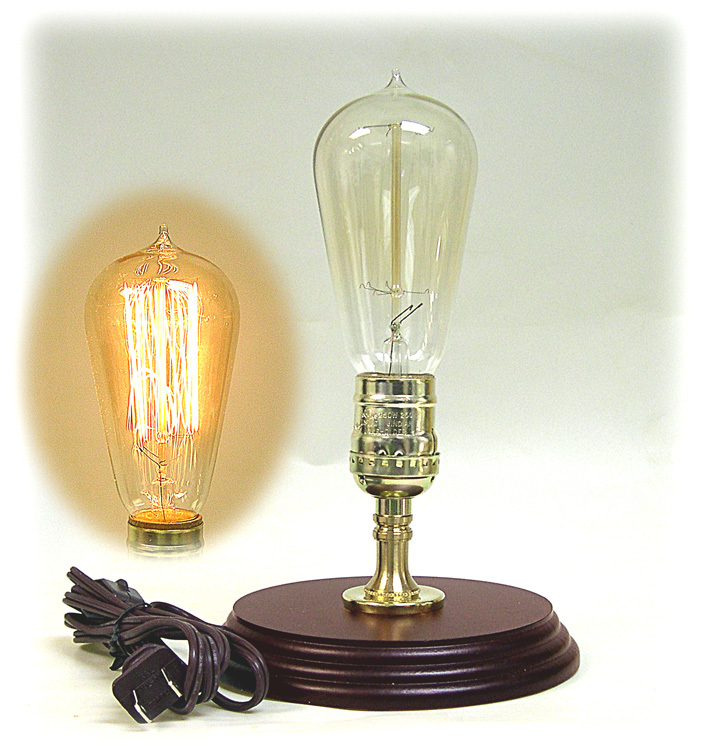 D) Wood Base LAMP KIT with 25W Antique Style Edison Bulb. Includes 6" round dark walnut finish Base, brass finish Socket, 6 ft. brown Cord with in-line on/off switch, brass Neck, Check Ring & mounting hardware. EASILY ASSEMBLED.